Linktree is ah-mazing. Super simple, easy to set up, and it makes those links customizable. Yep; you heard me! Once you arrive at their website (click here, & it will open in a new window), and log in with your Instagram account info. After that you should come to a screen like the one below (but with no info in it yet). For now, you can just leave the links in the order they appear as you add them. You can rearrange them later. Use the same process until you have all the links you need in that space. You'll see a preview of each as you build your list, over in the right hand side of your window. If you want to rearrange anything, use the dark grey area with the 3 dots on the left side of each bar. They allow you to drag each listing up or down in the list. Release your click when you have the listing where you want it, and the preview on the right will update. If you want, you can choose a different color scheme from the settings tab at the top of the page. There are 9 preloaded color settings, and if you upgrade to Linktree Pro, you can customize it further. On the Free plan, you can have an unlimited number of links in your list, and you can see link click totals. 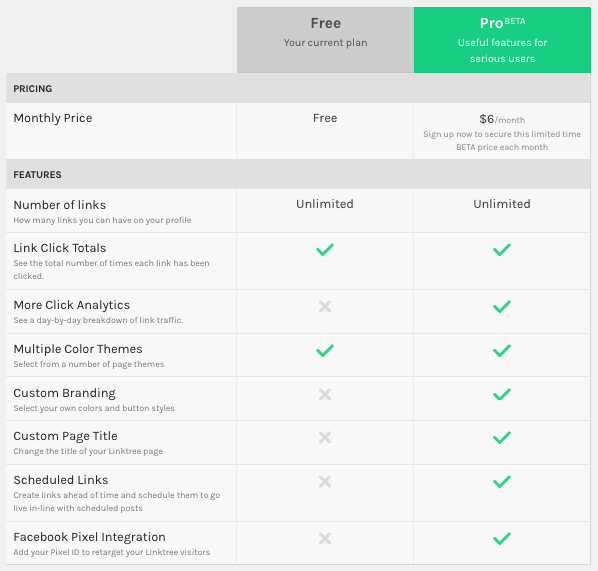 To access most of Linktree's features though, you'll need to upgrade. But their free plan will probably work just fine for most people. See their chart below (or visit their site to make sure there are no changes). There you have it! That was super easy, right? Try it out & tell me how it goes in the comments below! HAVE OTHER COMMENTS ABOUT THIS ARTICLE OR SUGGESTIONS FOR A NEW BLOG? COMMENT BELOW! I'D LOVE TO HEAR FROM YOU!